Stick upside down on shoes so that congregation can read them. Self adhesive stickers for shoes. One sticker is “She’s” the other sticker “Mine”. Perfect for your wedding/civil partnership. 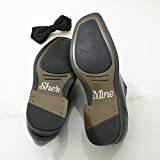 This entry was posted in Wedding Store and tagged Groom's, Mine, She', Shoes, Stickers, Wedding by Formal Affair. Bookmark the permalink.